A field trip like no other! The Mystic Seaport Ship to Shore Overnight Program offers your school group the opportunity to immerse itself in American history. By exploring the Museum’s seaport village and sleeping aboard the 1882 full-rigged ship Joseph Conrad, students will experience history in a way that simply can’t be done in the classroom. The past is made tangible at Mystic Seaport—from feeling the weight of a harpoon to seeing the view from the rigging of a historic ship. These immersive experiences augment and reinforce learning that goes on in the classroom, fostering an unparalleled sense of what the past was like and how it shaped who we are today. We understand that every student learns differently. Some will learn best from speaking with our experienced interpreters and Museum teachers, while others will respond best to the feel of the shipsmith’s hammer in their hand as they help shape a piece of hot iron. Our goal during the Ship to Shore Overnight Program is to help students gain a tactile understanding of the nation’s past. From setting type on a 19th-century printing press to cooking over an open flame in a historical kitchen, students will respond, engage, and most importantly, remember. There’s a lot to discover at Mystic Seaport, whether you’re interested in American history, the whaling industry, or the science and technology of navigating at sea. We work hard to tailor our agenda to fit the needs of your curriculum. From analyzing artifacts and primary sources in Primary Source Workshops to an examination of the role of music at sea with one of our chanteymen, Ship to Shore can work across subject divisions to provide a holistic educational experience. Here are a few of our most popular themes, but we’re happy to let you mix and match. Life in a Seaport Town: Learn about living and working in a coastal New England town. Hands-on explorations of specific professions (shipsmith, printer, etc.). All in the Same Boat: An overview of the New England whaling industry in the 19th century. Tour includes a harpoon throw and an option to row whaleboats. Haul Together; A Team-building Program Through the Eyes of a Sailor: Visitors Grade 4 and above discover the basic skills of mariners, discussing why these skills were important historically, and how/if they developed through history to the modern day. 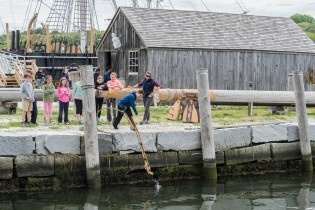 Mighty Mariners: In the classroom and on the water, students Grade 4 and up spend their day learning to sail with Mystic Seaport Museum’s Sailing Instructors, and in the evening learn the fundamentals of navigation. Call 860.572.0711, ext. 5119 or email overnight@mysticseaport.org.